We’re finally on to week two!! 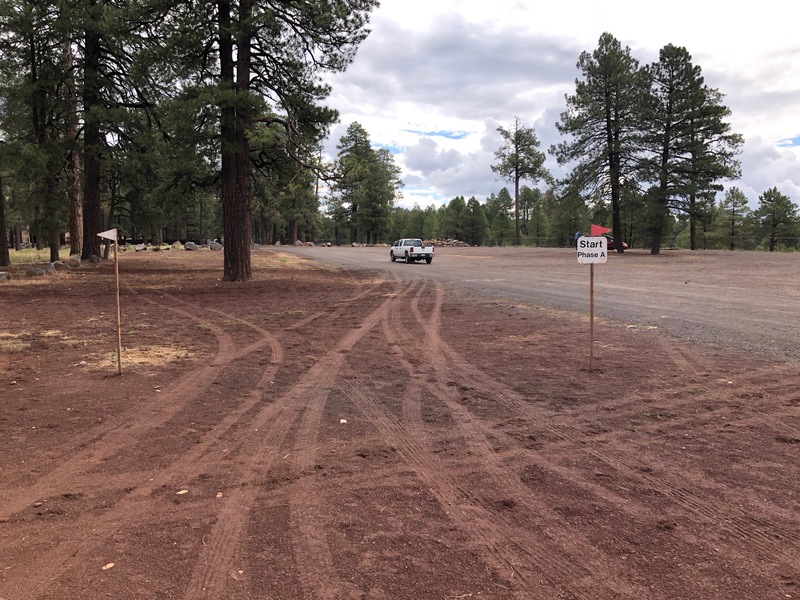 Week two – and the long format 3 day event – was the whole reason we went to Coconino. We were back to the hotel for for a few nights so we could both work. The ponies got a light ride on Monday. It was mostly just a hack around to stretch their legs, but we did take a bit of time to ride around in the terrifying stadium arena. Levi was still bugging out, but with brave Eugene leading him along we managed to w/t/c around. All the jumps were up, but I didn’t know if I was allowed to jump them without getting eliminated, so I skipped that, but I made him go all around the arena until he was calm. Then we did a bit of cantering and walking around the track. 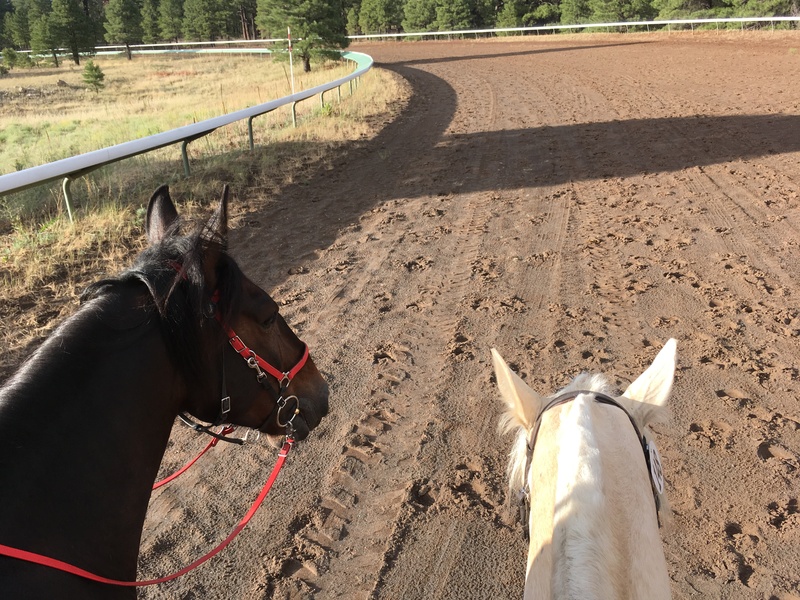 I’ve never ridden on a racetrack before Coconino, so that was fun. Coconino makes the whole long format event like a clinic. 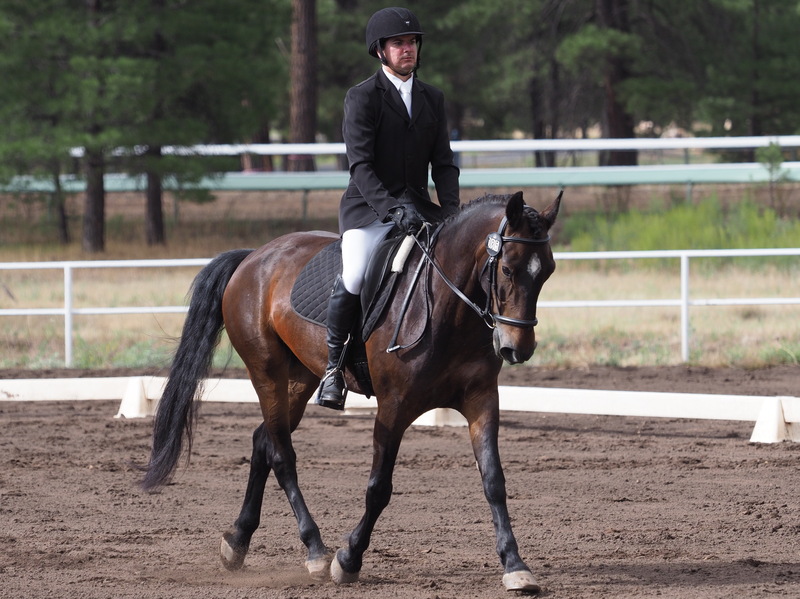 There are lectures and practices to help riders know what they’re doing. Tuesday afternoon was practice jogs and then a lecture on timing and vet boxes. Although we’ve done jogs for endurance, the jogs here were different. 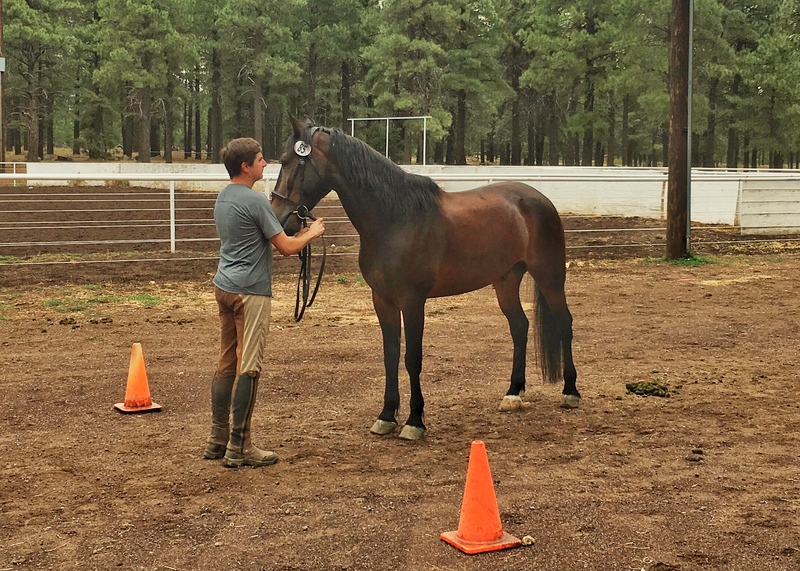 They wanted the horses to move in a particular way and you had to hold the bridle in both hands while the vets were checking the horse before the jog. It was a good thing they did the practice. The first time they jogged, Eugene tried to gait and looked off. 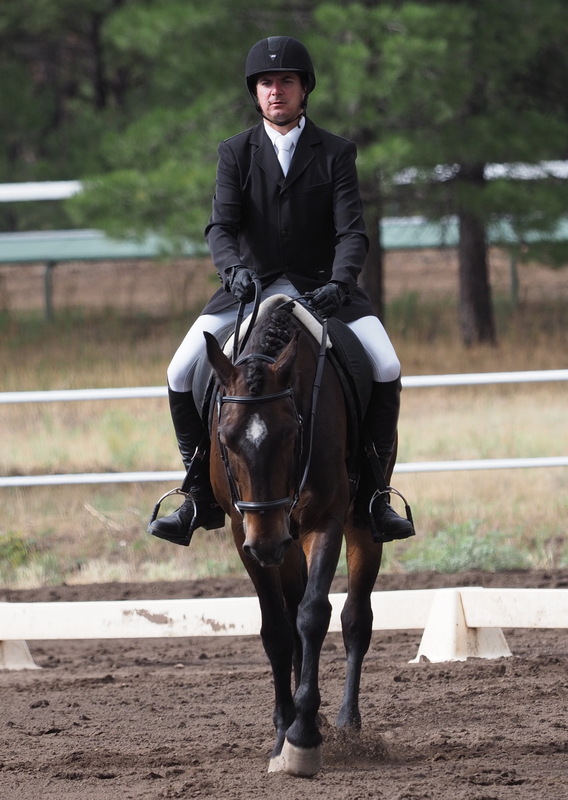 The judge had my husband hold his reins correctly and then slowly ease into the trot instead of rushing and dragging him and lo and behold: a sound horse. 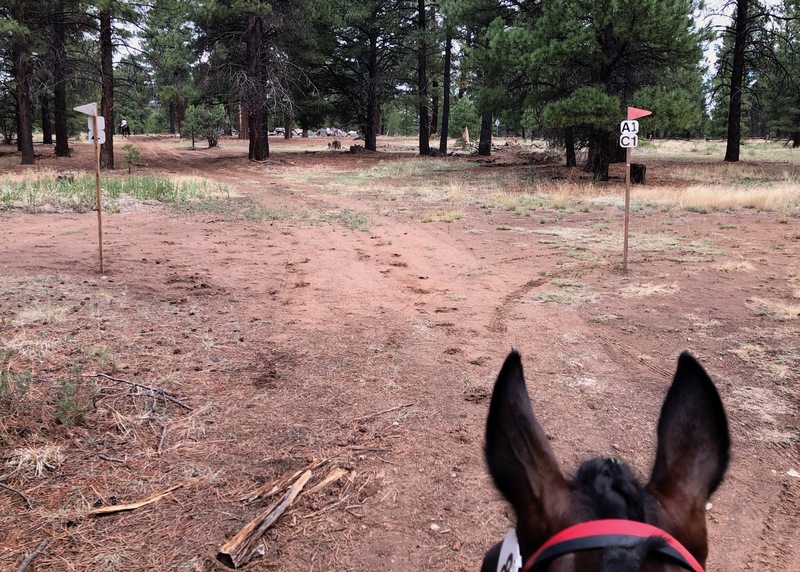 We did another brief ride around the track that evening to give them some exercise and then went back to the hotel for one last night. 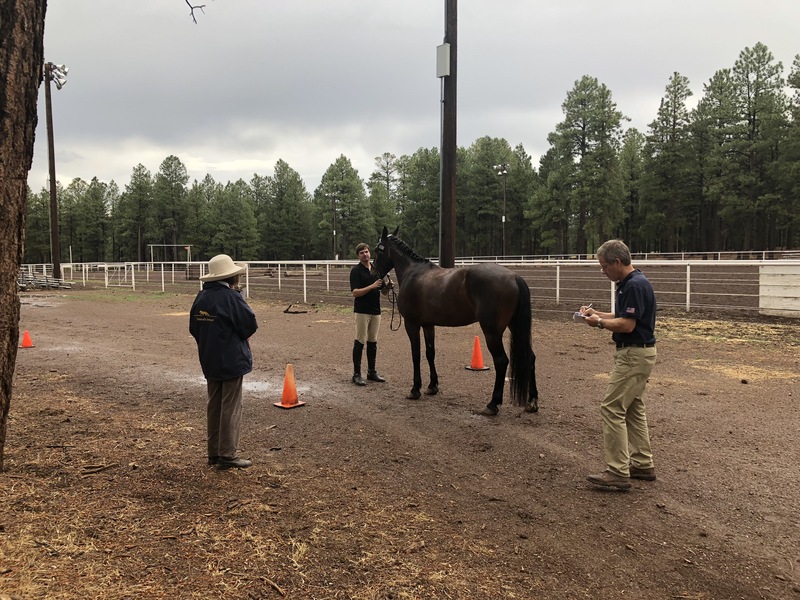 On Wednesday they had in barn inspections first, which is not a jog, but the vet checks heart rate, temperature, and respiration to have a baseline to compare to during XC. In typical fashion for this week, it was pouring rain. The only picture I have is from super far away because I was hiding under a roof over stabling across the driveway. 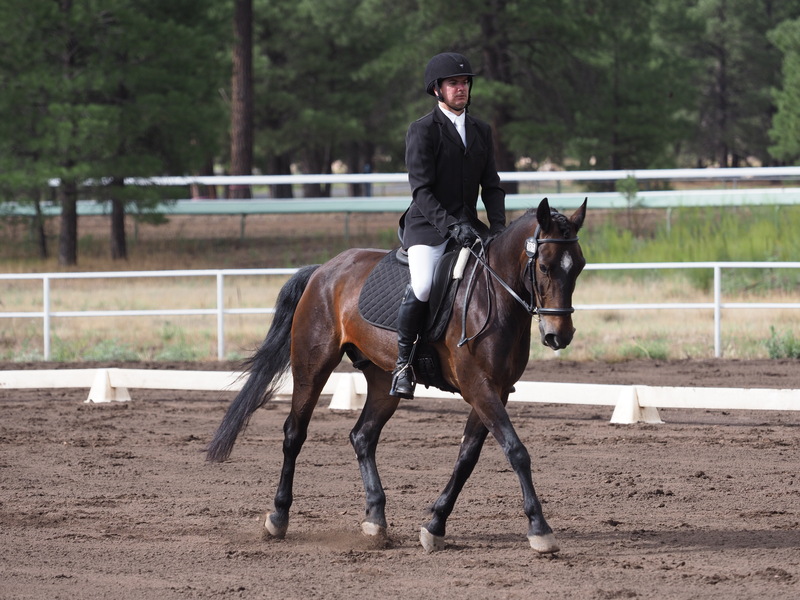 The official trot ups were later that afternoon. 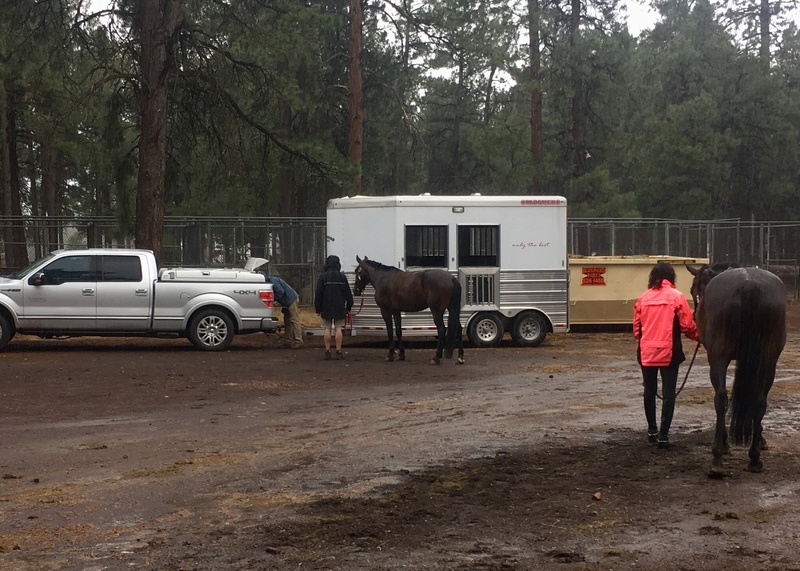 Because of our last minute flights and delays, we were more scrambled than usual in getting packed for Coconino. I’d told my husband to pack a nice outfit for jogs and he forgot. So he dressed in his riding pants, tall boots, and a polo as they were the nicest things we had with us. That was fine though, especially with how muddy and rainy it was. A lot of people had toned down their outfits because of the mud. The most important part is they were accepted. After jogs, we had a briefing at the grandstands and then all the 3-day competitors got driven around the roads and tracks in trucks to know where to go on Friday. The rain did manage to hold off long enough for us to drive around. Trying to drive large trucks through the forests was hair-raising at some points. Especially when you’re precariously perched in the back of said truck. We paused after section A to get out and have a talk about steeplechase and I took the opportunity to re-seat myself inside the truck for section C. It was a good choice. There was a dinner at the fairgrounds that night, but by the time we got back from roads and tracks it was mostly gone. We decided to go into town for dinner and to pick up a few supplies. Then we were back to camp for the night and get some sleep before an early morning and busy day. I didn’t know until we walked over that morning, but it turns out the 3 day competitors got two judges. 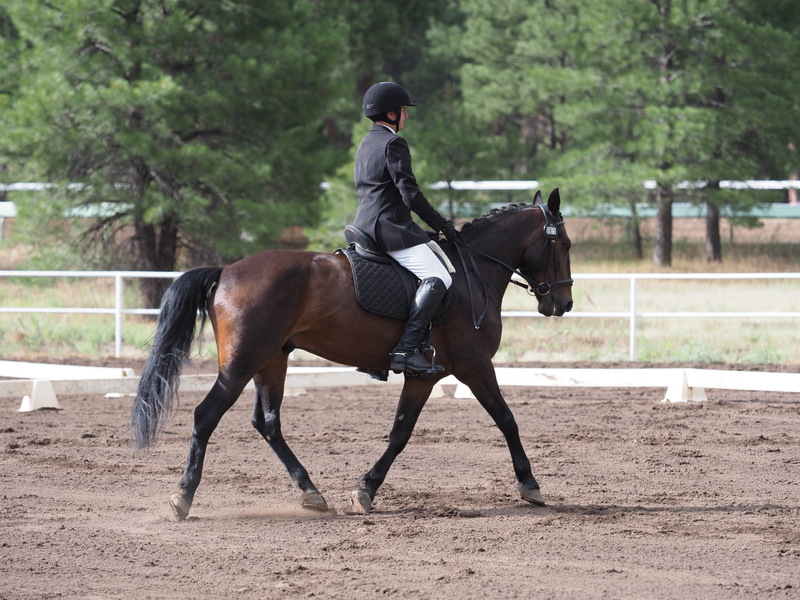 They had a judge at B in addition to C. While Novice and Training have official 3-day dressage tests, there isn’t one for BN. To make it a bit more difficult (as the Novice and Training long format tests are slightly more difficult than the regular A and B tests) , they used the Novice A test for the BN long format. Which works out perfectly for my husband as he’s done that test about a million times now. Watching their test, I thought it was one of the best tests they’ve done. It wasn’t perfect, but it was really solid. Outside of the canter transitions, it was really lovely. In going over the pictures, I was struggling with picking the best one, not because I needed to cherrypick the moment the looked the best, but because there were so many good moments, I had a surplus of choice. No head bob at the change of bend! Going through the two tests like this, I found it really interesting how alike the judges were in some scores and how different in others. The judge at B was overall more generous for everyone in the various 2 judge divisions. In some cases the judges were within less than a point of each other, but in others they differed by almost 8 points. It was interesting too how the position clearly effected some of the scores. 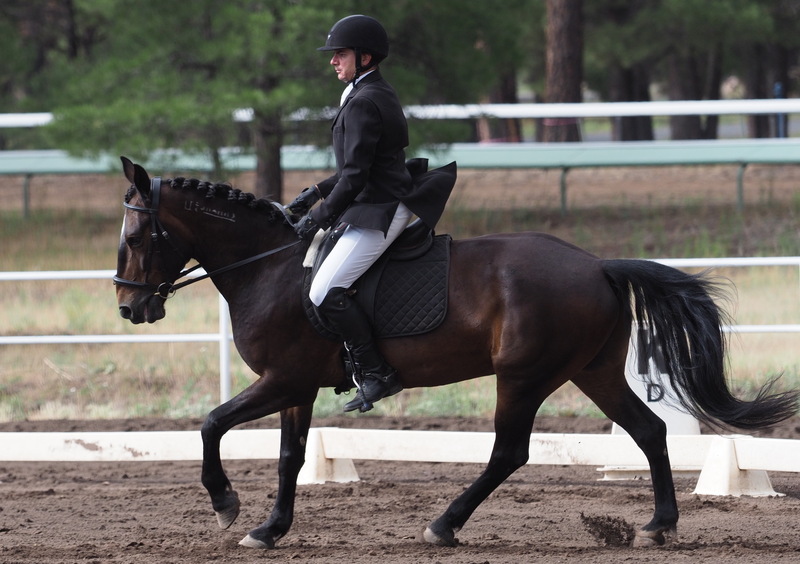 The right lead canter depart, for example, is heading straight towards the judge at B. That judge only sees an awkward canter depart, but can’t see the wrong lead issue like the judge at C can. Their combined score was a 37.1, which put them in 5th place out of 5. I watched all of the other people in their division and they were good. Even watching them warm up I was thinking they all looked like tough competition. 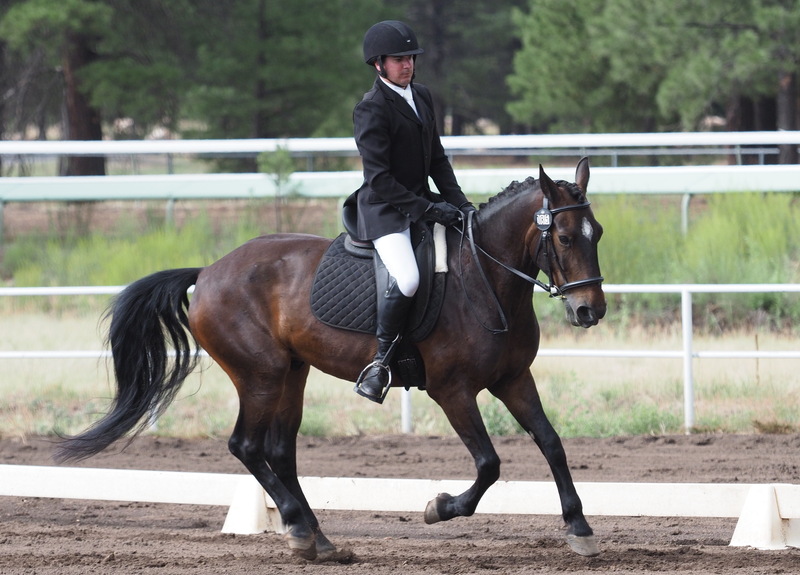 Eugene’s strong point will never be dressage, but this was a really good test for him. He was relaxed and much less fussy than in other tests. 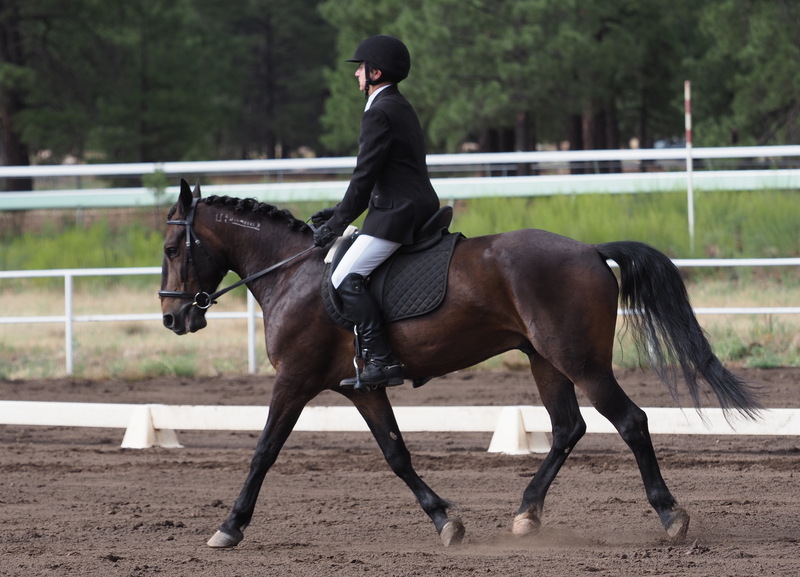 He really looked like a proper dressage horse. 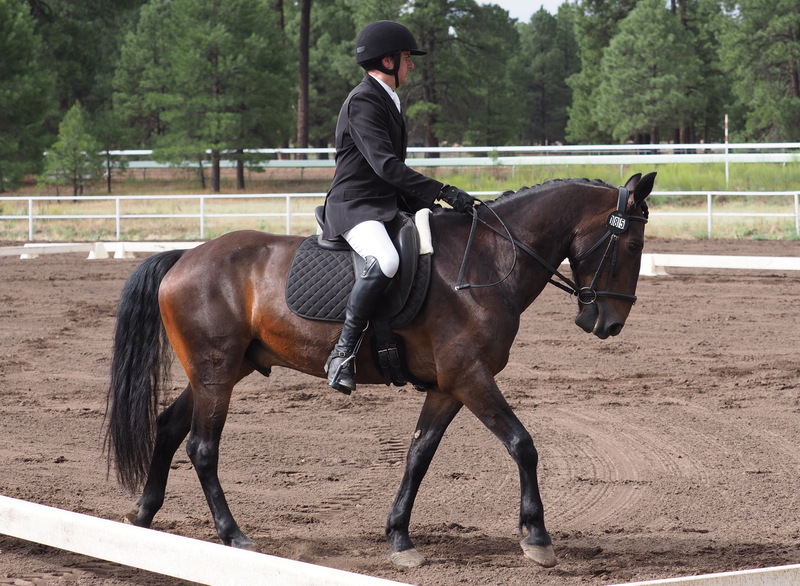 After dressage, my husband switched bridles and took Eugene out for a hack on roads and tracks. Because the 3 day event is considered a learning experience, they allow the competitors to do things you wouldn’t normally be allowed to do, like practice things. They had advised people to hack the roads and tracks if possible because getting lost would be a terrible way to get eliminated. He didn’t want to tire Eugene out so he stuck to a walk, but he still managed to pass people. During the truck drive, the organizer had made a comment about walking when he was discussing pacing. I forget his exact wording, but something about not walking on roads and tracks until you’re in sight of the finish flags because it’s very slow and you will lose time. Time is very costly in a long-format event because roads and tracks punishes time errors with a full point per second instead of the fraction of a point in XC. My husband and I both laughed and I said he’d never met Eugene. That little Mustang might rack up lateral comments in the dressage ring, but he can walk at 5+ miles per hour. He got a few comments about going so fast as he walked past people on the hack. 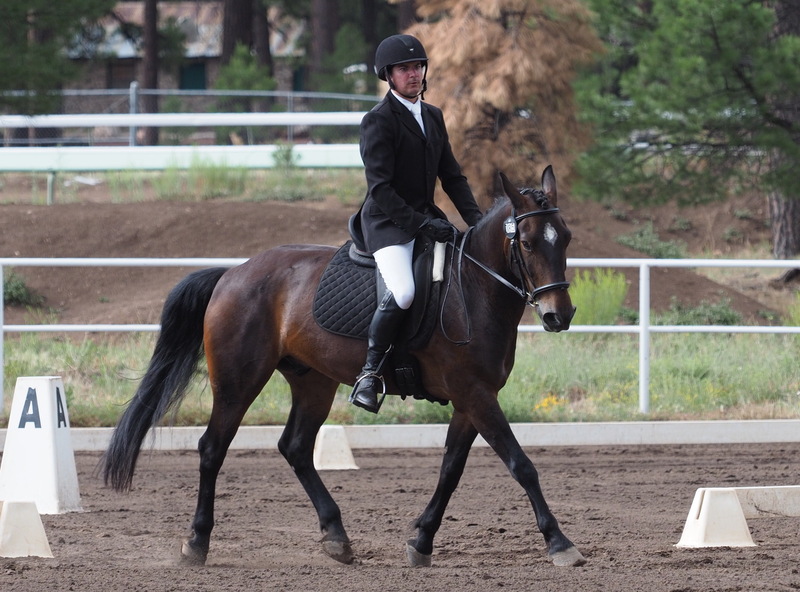 After the last dressage, they offered steeplechase practice on the racetrack. My husband thought about not going because it was pouring. But I told him he might as well practice in the rain since he might be doing it for real in the rain. They were soaked through. I was soaked through. We had planned to camp again that night, but decided to get a hotel instead. It was well worth it. Just getting a hot shower and then drying off was nice enough, but it happened to stop raining long enough for us to make a quick run to the hot tub. Worth it. 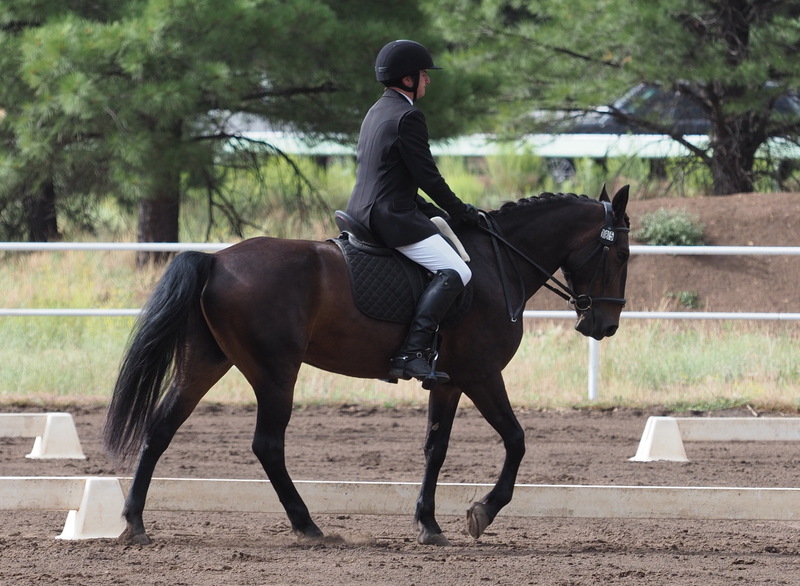 Stay tuned for a post about my own prep and dressage tomorrow. Ah man, so many memories seeing all these pictures. The Classic 3 Day at Coco remains one of my favorite things I’ve ever done. I hope your husband had as much fun as I did! He had a ton of fun. I think it’s probably one of his favorite events too. We were talking about trying to go back again next year. I’d love to do the Training 3 Day! We’ll see how things shake out. That’d be awesome. I hope you do it. My husband is already considering doing another long format. He’d like to qualify for a Novice one though and he needs 2 more clean novice runs. what a great post! i’m so curious to see a BN long format because they just added one to the schedule up here in the northeast and I’d LOVE to do it. i think I was excited FOR you when you said you got a hotel instead of camping. with a hot tub. that’s well worth it! I don’t mind camping, but I hate camping in the rain. It’s just miserable. I really like how they had two judges! So interesting to read the different comments and to note that they may see things very differently based on location. At some of our finals they will stagger the judges, and it’s funny what you might be able to hide just based on where the judge is looking from. Very excited to hear about your start to the week too! I was a unique experience having the two judges. It definitely makes it harder to hide mistakes. Sounds like a great start to the event (save the weather maybe :P). It’s cool to see the different feedback from each judge. The weather. Ugh. At least monsoon season lowered the temperatures and we were no longer sweating buckets. Those are some great expressions during dressage; esp during the videos; I ride a horse called Bedford who is great at those as well. His favorite is the ‘grind teeth and pin ears’ when asked to canter before he’s ready to. Loved reading your blog, found it through a comment on my page! Well stay tuned, because Levi is even better than Eugene at making faces. It was a good time despite the rain. Looks like so much fun!! I’m so hoping I can do the novice 3 day some day! The novice 3 day was tough! 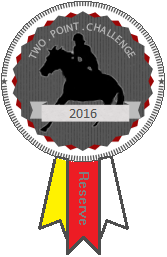 The BN 3 day was tough enough, but the novice was quite a bit harder. 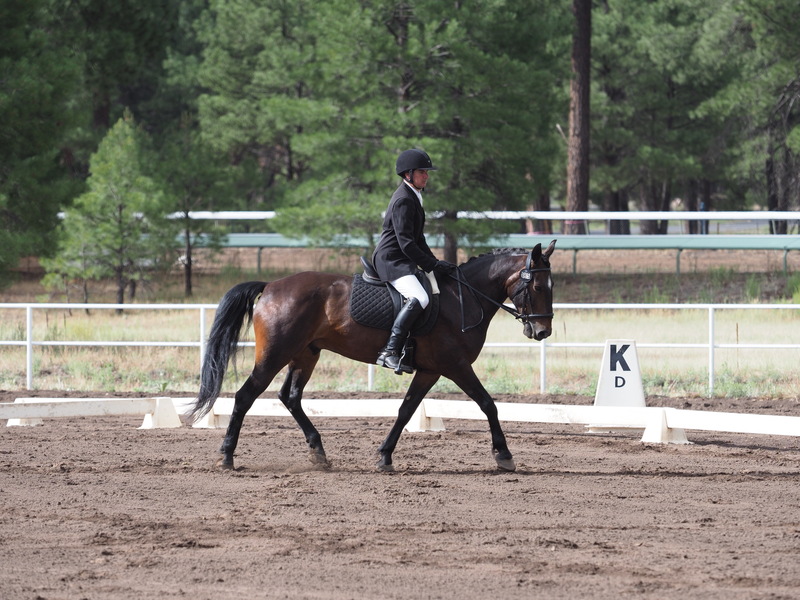 Great dressage test for Eugene and your husband! It sounds like staying there for an extended period was really beneficial. Week two went a lot better than week one.